On the outskirts of the rural French village of Chantillon, the old bus driver Basile boards his bus to begin his daily trip through the French countryside. Before the day is over, he will make a dozen stops. Several familiar and unfamiliar passengers will get on and off his bus. An unnamed rider is watching and eavesdropping on the conversations between the riders. She or he gains exceptional knowledge of the bus riders and records the proceedings for posterity. And so we have Jacques Jouet’s My Beautiful Bus, an eccentric journey through modern rural France and allegorically through our complicated postmodern world. Although My Beautiful Bus has an ensemble cast, the book is centered around Basile and his long-time wife Odile. Basile love his wife; Odile’s feelings for her husband are more ambiguous. The passengers on the bus—particularly the coquettish teen Nathalie and the virile Hans Martin—suggest that Basile and Odile have bordered on relationships that could rock their marriage, but Mr. Jouet is too clever and subtle to bring either to the point of lust. Concurrent with the passenger coming and goings on the bus, a variety of intellectuals, pop culture figures, and historical luminaries make cameo appearances in Jouet’s narrative, including: Blaise Pascal, Charles Pierre Baudeliare, Puss (from Puss and Boots), Scrooge McDuck, and even Jesus Christ. Mr. Jouet’s writing is particularly confident during his musings on these various figures, even if these musings give the book an undisciplined, meandering quality. Whether My Beautiful Bus is even a novel is an open question. At 131 pages, it lacks the space for a fully developed plot. The book lacks chapters and has no climax. There is not an obvious hero, or villain. 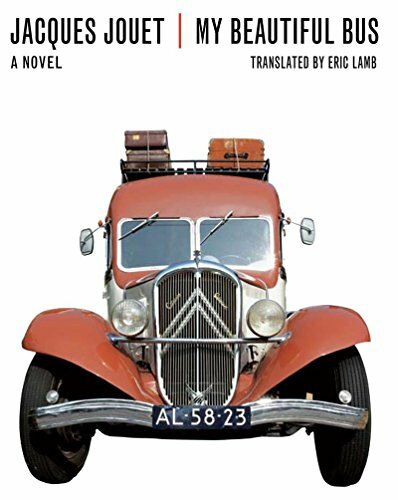 With My Beautiful Bus, Jacques Jouet, a descendant of the modernist literature introduced by Samuel Becket a century ago, writes successfully within the absurdist conventions of this (theoretically) conventionless genre. And while Mr. Jouet appears influenced by Samuel Beckett’s Waiting for Godot, there’s also the vibe of Thornton Wilder’s Our Town to My Beautiful Bus. With respect to contemporaries, Mr. Joeut’s work is far less magical and far more real than the works of the magical realists: Allende, Anaya, Marquez, etc. Yet even with these differences My Beautiful Bus taps into the great strengths of magical realism: lovely allegory and a focus on the conflicts and triumphs occurring on the borders of everyday reality and imagination.